This distinctive range features vintage-style illustrations paired with the most environmentally friendly paper on the market. New designs are released each year and the brand is focused on continuing to develop a deep and robust range. This family business has been running in America since 1949, originally as a book publisher and printer – Michael Rogers. The original clothbound notebook design of Decomposition Book was developed as a twist on the classic composition book, used by school children across America. 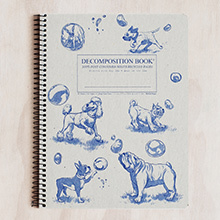 Decomposition Book is created from 100% consumer waste product, with soy-ink printing on the covers. The wraps feature the same environmental focus in their production. The range is still proudly made in the USA. This core range comes in both large and pocket sizes, with the illustrated covers common across sizes. The inside covers feature useful trivia, a spot for a name/subject/reward and also some environmentally friendly stats. With the same great paper and styling, these spiral bound notebooks are a larger format, versatile notebook. New fun & quirky designs adorn the latest range: Duck Duck Goose, Flying Sharks, By the Slice, Limes and Pear Bears. These wrap sheets are created from the same 100% post consumer waste paper, in a fantastic thick sheet that makes them ideal not only for wrapping, but craft projects too. 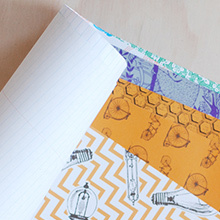 They feature the same distinctive prints that adorn the notebook ranges. A unique and popular range suited to independent and University bookshops, or gift stores looking for stand-out products with a conscience. Telegram Co. is the official, exclusive distributor for Decomposition Book in Australia and New Zealand. 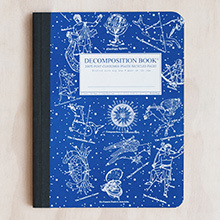 Interested in stocking Decomposition Book? Please complete our retail partnership enquiry form.